The Mayors’ Commission on Homelessness and Affordable Housing are hosting the upcoming second annual Homeless to Hope Benefit Concert, which will include recent South Carolina Music Hall of Fame inductee Blue Dogs, soulful vocalist Zandrina Dunning and BlackNoyze Band, percussive Americana Rock band Rene Russell and the Bottom End, and singers from the College of Charleston Choir, Charleston Symphony Chorus and Taylor Festival Choir under the direction of Dr. Rob Taylor. There will also be special musical appearances by Charleston Mayor John Tecklenburg and Mount Pleasant Mayor Will Haynie. 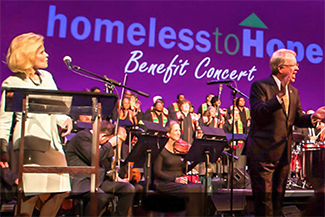 The Homeless to Hope Benefit Concert will take place at 6:30 p.m. on Sunday, August 25, 2019 in the Gaillard Center Performance Hall. Proceeds will benefit the Homeless to Hope Fund, which helps citizens transitioning out of homelessness by providing support through a network of community organizations and service providers. Tickets are available for purchase at www.homelesstohopefund.org/benefit-concert. Raffle tickets can also be purchased online for a chance to win either two VIP tickets and backstage passes to the Hootie & the Blowfish Group Therapy Tour Concert, or a guitar singed by Darius Rucker, members of Hootie & the Blowfish and Edwin McCain. For more information on the Homeless to Hope Fund, visit www.homelesstohopefund.org/.